← Why Does Maria Cantwell Hate Jobs For Americans? And why does Facebook not care? While conservatives have been exercising their right to mock over the Obama campaign’s Attack Watch Twitter account, something more insidious and infinitely more creepy is going on over at Facebook. For those of you who know me, it will come as no surprise to hear that I loathe Facebook. I use it, yes, to keep up with far-flung friends and family but the place is a hot mess and there are ongoing privacy concerns. Then today, I happened to see this post over on Google+ and went to check it out. As it turns out it’s true! 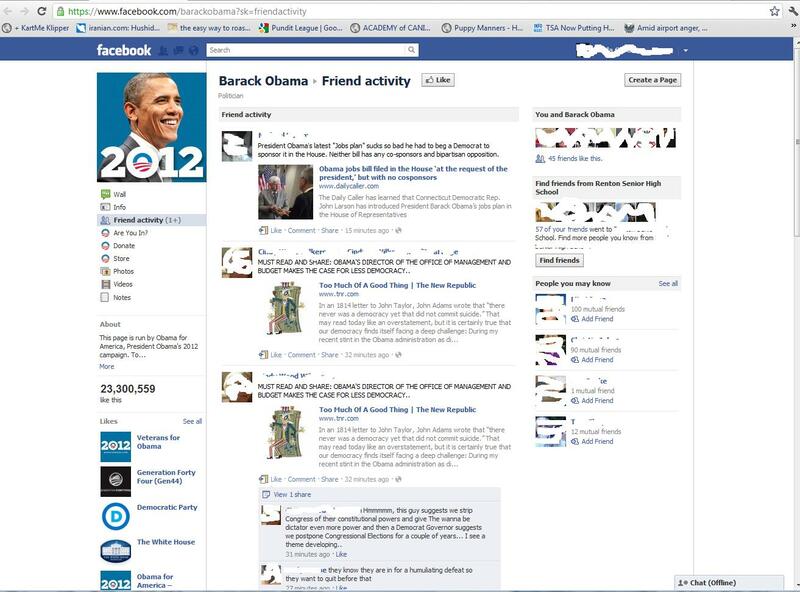 The Facebook page operated by Obama for America’s 2012 campaign compiles Obama-related updates from all over Facebook to this page…even updates from private and secret groups! If you scroll through the page (I’m not linking the page here because, even though it’s a public page, I feel like I would be invading people’s privacy by doing so), you can see that many if not most of the posts are, how shall I say this, not complimentary to the President. So while conservatives have been freaking out on Twitter over Attack Watch, OFA has been compiling a sweet little enemies list, unbeknownst to all. Or at least to me and quite a few others. Update 1: As it turns out, I should have titled my post, Why Does Facebook Hate Your Privacy, but that wouldn’t have been news, now, would it? This shocking breach of privacy isn’t a special privilege granted to the Obama campaign or some kind of clever hack on their part. No, it’s a Facebook “feature.” Although I’m admitting, it escapes me why Facebook’s developers would think people would want their content randomly distributed on pages they may or may not have “liked” or perhaps aren’t even aware of. Even so, for the most part this is probably harmless, but when the page or pages in question are administered by elected officials, it does still have a Big Brother feel to it. So while it may not be intentional on the part of the Obama campaign (or any other elected official with a Facebook page), it’s still a neat way to “keep your enemies closer,” courtesy of Facebook. FYI, as far as I can tell, the only way to ensure your content doesn’t pop up in random places around Facebook is to avoid mentioning anyone of consequence. Ever. Or close your Facebook account. Update 2: Okay, okay…I think I have this straight now. When you go to a page such as Barack Obama and click the “Friend Activity” link, Facebook assembles a list of what your friends are saying about (in this case) Barack Obama on the fly so everyone sees something different. Even the page admin sees only what he would otherwise have access to via his friends, groups and pages. Or so it’s been explained to me. So I now have no qualms about invading people’s privacy when linking the page that started it all. I’m feeling pretty confident that everyone’s privacy is being protected…at least in this instance. Barack Obama may hate your privacy and Facebook may mock your feeble attempts at feeding your information only to those you want to have it, but this is not a case of either. It is, however, a perfect example of Facebook being counter-intuitive to the user and how applications that grow over time can become so awkward they out-live their own usefulness. Young or old, Democrat, Republican, or Independent, this will affect YOU if the laws go into effect ! You will no longer have a private life without government control, from birth to death ! 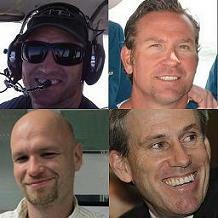 Please watch the entire video….it is ALMOST unbelievable! Then forward it to everyone you know. click on website below…. And……in addition to all these “attributes,” the cost of our Medicare insurance will continue to sky rocket! James and Sheila, read my latest update. All is well…or as well as can be expected where Facebook is involved. Your update makes FB sound like it’s grown into becoming this “too big for its britches” tangled, confused mess. I’m there because cousins and friends are. I do “like” some conservative candidates and a few Tea Party pages there…..Oops !…I’m a terrorist !. I save my criticism of barry for other places, (like email, blogs & message boards) not FB. i’ve been on the computer much more today than I have ever been before reading many articles and people’s comments about facebook and the IPO in additional to my usual 1/2 hour per day computer usage. Out of ALL the posts I’ve read today from people who claim to “not like” or “hate” or “feel creepy” about facebook – NOT ONE of them said I AM NOT ON FACEBOOK. They all had a reason/excuse to be on it. They ALL said I’m only on it because of this, or I’m only on it because of that etc..etc……….. Am I the only person who is confident enough to say I AM NOT ON FACEBOOK — yes all my friends, family and co-workers are on it and we’ve all been made to feel pressure to be on it. It’s a bunch of adults acting like teenagers who are under peer pressure. I don’t care what people think. Don’t you see that facebook is exploiting everybody’s neediness to be “popular” , “important” and included in the “in-crowd”. Facebook is telling you all that you are more important than you really are and you’re falling for it while they are laughng all the way to the bank. They are billionaires and are literally making a FORTUNE off of you by exploiting your need to be loved, included and accepted,etc. and you all just mindlessly keep giving and giving more of your private affairs, telling all, giving them rights to all your pictures like a bunch of lame ducks. Oh, and what about your valuable time. Time is money and I’m sure your master, Mark Zuckerberg would agree. THEY SHOULD BE PAYING YOU FOR ALL THIS STUFF, but unfortunately slaves do not get paid, but at least they get room and board. Does Mark Zuckerberg pay some or all of your rent or mortgage? Does he make enough money to pay for your measly little cottage? You think his house is a little bigger than yours? No, I’m sure he lives in a moderate $300,00 house. Right? Ya think??? LOL I never knew how weak, helpless and defenseless the American population has become. It’s very sad. I hope that people will wake wake up and not let people take advantage of them or you can choose to just TRUST AND OBEY without question while he gets richer and richer and you get poorer and poorer. You are all Mark Zuckerberg’s and his cronies servants.